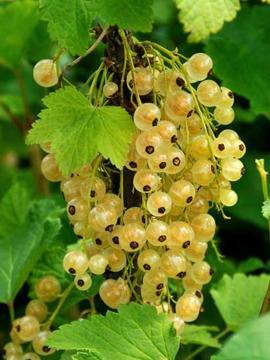 Abundant long trusses of fairly large creamy-white berries with an excellent flavour. Fruits ripen in late July or August. Well know for reliable and heavy cropping. Moist, well drained, moderately fertile soil in sun or light part shade. Grows and fruits well in cool areas. Prune in February, cutting out old and dead wood, cut back mature and long sideshoots, keep the centre of teh bush quite open. From cuttings, preferably with a heel.